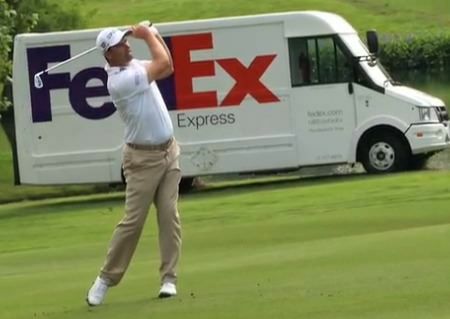 PGA Tour — Pádraig Harrington — pictured doing his bit to raise awareness for the campaign against testicular cancer — bounced back from two early bogeys and some disconcerting putting to open with a solid two under 68 in the weather-interrupted FedEx St jude Classic in Memphis. Harrington managed to finish before heavy afternoon thunderstorms led to a three and a half hour suspension. The Dubliner was two over par after three holes but recovered thanks to four birdies in a five holes stretch around the turn. He missed two putts inside four and a half feet in his first seven holes, three putting the par three 11th (his second) from 16 feet for bogey and then following a bogey at the 12th with a three-putt par-five at the 16th, where he missed inside three feet, according to Shotlink. A birdie from 12 feet at the 17th turned his day around, however, and he then reeled off a ha-trick of birdies to start his back nine, holing from 33 feet at the first, five feet at the second and eight feet at the third before closing with an eight foot par save at the ninth. 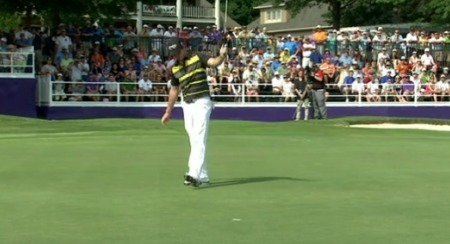 "I'd a horrible start," Harrington said. "I hit it close on the first couple of holes and had two three-putts really from nowhere. "So, I'm two-over through six and not feeling good, then I hole a nice putt on 17, my eighth, and birdie one, two and three, chipping-in at the first. "I probably played the back nine, my first nine, better. I'd a lot of chances. I'd good up-and-downs at six, eight and nine, so I'm pleased with that as well. It's always important to make those to keep a round going." Back after a three-week break, Graeme McDowell was a late starter — even later because of the thunderstorm. But having raced to two under par with six holes to go, he dropped back to back shots at the 13th and 14th before a birdie at the 15th left him four shots behind clubhouse leader Peter Malnati on one under with just the 17th and 18th to complete today. European Tour — Simon Thornton shot a one under 71 to lead the Irish challenge in the Lyoness Open powered by Greenfinity as Mikael Lundberg claimed a share of the first round lead . Lundberg, a winner of the Russian Open in 2005 and 2008, has had to come through Qualifying School in each of the last three seasons but fired a five under par 67 to join Adam Gee at the top of the leaderboard at a windy Diamond Country Club. Thornton is tied for 26th with Michael Hoey 42nd on one over after shooting a 73 alongside Vienna resident Miguel Angel Jiménez and Rosapenna's Ruaidhri McGee, who battle back from bogeys at his first two holes. Kevin Phelan (75), Peter Lawrie (76), David Higgins (77) and Damien McGrane (78) are outside the projected two over par cut line. As France’s Damien Perrier shot a sparkling six under par 65 to share the lead with the Czech Republic’s Ondrej Lieser, Dunbar carded a level par 71 to share 59th place at Tecina Golf on La Gomera in the Canaries. Birr's Stephen Grant and Killarney's Danny Sugrue are tied for 100th after three over 74s.